Powered by a quad-core 1.8GHz Intel Atom processor with PowerVR Series 6 graphics, 1GB of RAM and 8GB of storage, the Asus-built box is the first device with Google's new Android TV operating system on board. Which, if you haven't been paying attention, is designed to be everything Google TV was not. Where Google TV was a confusing power-user experience driven by the web, with a tiny siloed collection of apps, few games, and where you needed a keyboard to get very far, Android TV channels the full power of Android into a super simple set-top-box interface more like Amazon's Fire TV. (It even uses an identical game controller — sold seperately for $40.) You can get your apps from Google Play, and biggies like Netflix, Hulu Plus, YouTube (of course) and Vevo are already confirmed. The box also comes with $20 in Google Play credit. Android TV sports a single flat interface you can scroll up, down, left or right to navigate through all your applications with a dead-simple remote control with just four buttons and a d-pad, though you can also just say what you want — just press the voice search button up top and speak into a mic embedded in the remote. If Google plays its cards right, though, you won't need to do much scrolling or voice searching: Android TV will supposedly automatically suggest things to watch based on the data Google collects from you across all its services, and present those recommendations front and center as soon as you turn the box on. 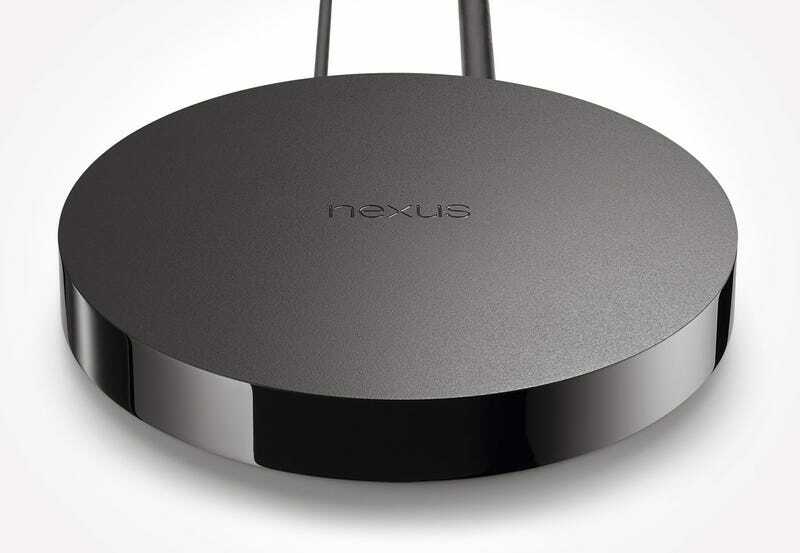 Oh, and the Nexus Player also doubles as a Chromecast, meaning you can start or resume content from any PC, smartphone, or tablet (no matter the operating system) by pressing a single button to beam instructions to the set-top. Start watching on your phone, pick up on your TV. Go get a snack and take your show with you. Though unlike the Chromecast, this sucker has faster, more reliable dual-band 802.11ac Wi-Fi.